Know who is on duty! A web-based scheduling program enables your members and administrators to view, maintain and update duty schedules from any computer with internet access. Members easily schedule individual and recurring shifts through a simple to use interface. Information about members currently on duty is continuously displayed on any computer with internet access so that your station and dispatchers know who is immediately available to respond to a dispatch. In addition, the reporting system tracks the on-duty hours of your members, which simplifies your record keeping and provides you with valuable information. Know who is available! 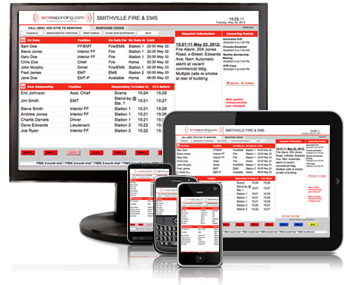 Even for those departments and agencies which do not schedule duty crews, members can use the web-based scheduling system to advise their department/agency of their availability or unavailability. For example, if a member is at home or work and knows that they can respond to any incident during the next 7 hours, they can log in and put themself "on duty" for the next 7 hours. Members who will be out of town or simply unavailable can schedule themselves as "out of service" for "X" hours or days. This enables their department/agency to be able to assess their in-town, available manpower resources at any time.